Amie Valpone’s clean eating journey began 10 years with an unexplained illness and then, with a complete and total clean eating detox, she reversed her symptoms. She’s now sharing her story in her cookbook, Eating Clean: The 21-Day Plan to Detox, Fight Inflammation and Reset Your Body. Today she’s sharing a simple salad that is great tasting and good for you too! 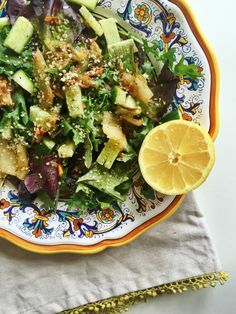 In a large bowl, massage the kale with the lemon juice, olive oil and sea salt for 2 minutes or until the kale is very tender and dark green, about 2 minutes. Add the cooked quinoa, apple, celery, cashews, red onion and fresh dill; toss to combine. Season to taste with sea salt and pepper. Set aside. In a small bowl, whisk the dressing ingredients and pour over the salad. Toss to combine and serve immediately. Try more of our vegetable-based recipes here: Eggplant ‘Toast’ 6 Ways, Vegetarian Italian Farro Bowl, Cleansing Honey Lemon Quinoa Bowl, and Roasted Garlic and Beet Soup With Cucumber Dill Yogurt. AMIE VALPONE, HHC, AADP is the Editor-in-Chief of www.TheHealthyApple.com; she is a Manhattan based Celebrity Chef, Culinary Nutritionist, Professional Recipe Developer, Food Photographer, Writer and Motivational Speaker specializing in simple gluten-free, soy-free and dairy-free ‘Clean’ recipes. Connect with Amie on Facebook, Twitter, Instagram, and Pinterest @TheHealthyApple.